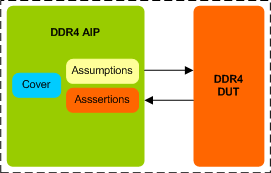 DDR4 Assertion IP provides an efficient and smart way to verify the DDR4 designs quickly without a testbench. The SmartDV's DDR4 Assertion IP is fully compliant with standard DDR4 Specification. Supports DDR4 memory devices from all leading vendors. Supports 100% of DDR4 protocol standard JESD79-4/JESD79-4A/JESD79-4A_r2 and JESD79-4B_draft.pdf. Supports all the DDR4 commands as per the specs. Quickly validates the implementation of the DDR4 standard JESD79-4/JESD79-4A/JESD79-4A_r2 and JESD79-4B_draft.pdf. Supports the following burst types. Supports for Data Mask and Data Bus Inversion(DBI). Supports for write Leveling for calibrations. Supports for Fine Granularity Refresh Mode. Supports for ZQ Calibration commands. Supports for CRC for Write Operations. Supports for Multi purpose Register. Supports for Per Dram Addressability. Supports for CAL Mode Operation. Supports for Command Address Parity features. Supports for Control Gear down mode. Supports for Maximum Power Saving mode. Supports for both Synchronous and Asynchronous On-Die Termination modes. Constantly monitors DDR4 behavior during simulation. Supports Simulation mode (stimulus from SmartDV DDR4 VIP) and Formal mode (stimulus from Formal tool). Rich set of parameters to configure DDR4 AIP functionality. SmartDV's DDR4 Assertion env contains following.